Polish Hebrew scholar and archeologist; born at Tarnopol, Galicia, March 17, 1801; died at Odessa Oct. 29, 1864. He received his early Hebrew education in the ḥeder and from his father, Shebaḥ ha-Levi, a noted preacher, who instructed him in mathematics and German also. In his youth Pinsker was an enthusiastic admirer of the Ḥasidim, but soon forsook them. He at first engaged in business, but, having no aptitude therefor, was obliged to abandon it. He then went to Odessa, and, owing to his calligraphic skill, became secretary to the rabbi. Here, in conjunction with Isaac Horowitz of Brody and Littenfeld, Pinsker succeeded in establishing a public school for Jewish children, of which he himself served as principal until 1840. At that time Abraham Firkovich, a Karaite scholar, brought to Odessa a number of ancient manuscripts, unearthed in the Crimea. Among these was one of the Later Prophets which had a singular punctuation, differing widely in the form of the vowels and singing-accents from the one then in use. This manuscript gave ample opportunity to Pinsker to satisfy his propensity for research. He at once set himself to the task of deciphering the system of punctuation, and satisfactorily accomplished it. He had already become known as an archeologist of merit through his contributions to the "Orient"; but with this discovery his fame was established. He was thereupon honored by the Russian government with two gold medals and with the title "Honorable Citizen"; and the community of Odessa bestowed upon him a life-pension of 300 rubles a year. 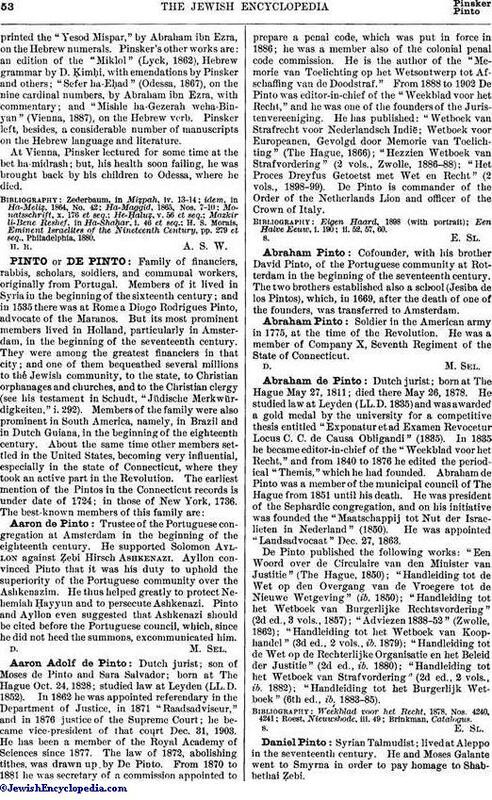 Pinsker then retired from communal work, and repaired to Vienna in order to devote the rest of his life to his researches and to the arrangement and publication of his works. Of these the first and most important one was "Liḳḳuṭe Ḳadmoniyyot" (Vienna, 1860), in which he describes the different periods of development in the history of Karaism. He maintains that the term "Karaite" is derived from the Hebrew "ḳara" ( ) = "to call," "to invite," and that its use dates from the first period of the schism, when the members of this sect sent messengers throughout Jewry "to invite" the people to join their ranks ("Liḳḳuṭe Ḳadmoniyyot," p.16). 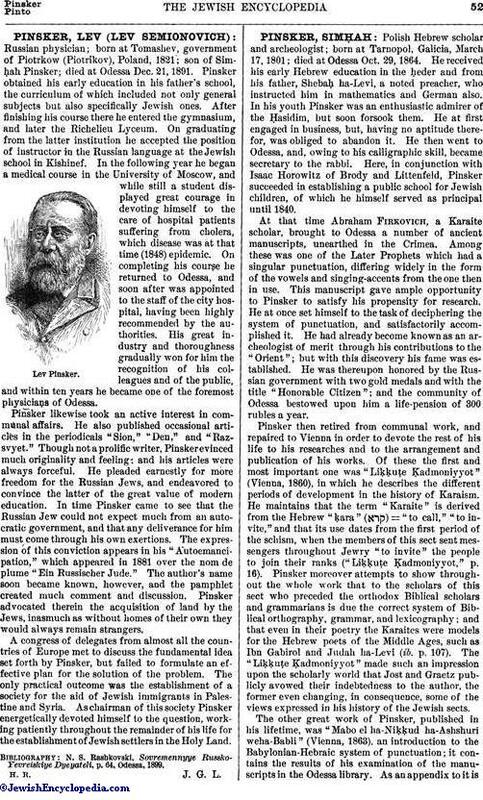 Pinsker moreover attempts to show throughout the whole work that to the scholars of this sect who preceded the orthodox Biblical scholars and grammarians is due the correct system of Biblical orthography, grammar, and lexicography; and that even in their poetry the Karaites were models for the Hebrew poets of the Middle Ages, such as Ibn Gabirol and Judah ha-Levi. (ib. p. 107). The "Liḳḳuṭe Ḳadmoniyyot" made such an impression upon the scholarly world that Jost and Graetz publicly avowed their indebtedness to the author, the former even changing, in consequence, some of the views expressed in his history of the Jewish sects. The other great work of Pinsker, published in his lifetime, was "Mabo el ha-Niḳḳud ha-Ashshuri weha-Babli" (Vienna, 1863), an introduction to the Babylonian-Hebraic system of punctuation; it contains the results of his examination of the manuscripts in the Odessa library. As an appendix to it isprinted the "Yesod Mispar," by Abraham ibn Ezra, on the Hebrew numerals. Pinsker's other works are: an edition of the "Miklol" (Lyck, 1862), Hebrew grammar by D. Ḳimḥi, with emendations by Pinsker and others; "Sefer ha-Eḥad" (Odessa, 1867), on the nine cardinal numbers, by Abraham ibn Ezra, with commentary; and "Mishle ha-Gezerah weha-Binyan" (Vienna, 1887), on the Hebrew verb. Pinsker left, besides, a considerable number of manuscripts on the Hebrew language and literature. At Vienna, Pinsker lectured for some time at the bet ha-midrash; but, his health soon failing, he was brought back by his children to Odessa, where he died. H. S. Morais, Eminent Israelites of the Nineteenth Century, pp. 279 et seq., Philadelphia, 1880.